Preheat the oven to 200C, gas mark 6. Line a baking sheet with non-stick paper. For the ganache, break the chocolate into pieces and put it in a heat-proof bowl with the cream. Set the bowl over a pan of very hot water. When the chocolate is half-melted, take the bowl off the pan. Stir the chocolate until melted, then beat the ganache as it cools. 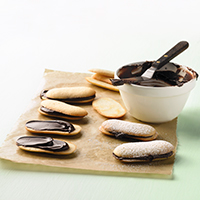 Spread 1 tsp ganache on a biscuit. Place another biscuit on top, pressing down gently. Repeat with the rest of the biscuits. Leave in the fridge for an hour to firm up, then dust lightly with the icing sugar before serving.